Milken offered a mock trial elective for many years, but they were unsuccessful and the course was eventually disbanded. Upon her move to Milken from New York, Alexandra Orbuch ‘20 founded the team, and for the first time in 27 years, the team has made it past the preliminary rounds. They placed in the top 24 teams of the county, losing by a mere 2 points to the team who continued on to win the entire Los Angeles County region. “Mock Trial is a team where students assume the roles of attorneys and witnesses and argue in a legal case. It is an enjoyable extracurricular activity that is well suited for many people,” said Alexandra Orbuch ‘20, the team captain. The team of ten meets throughout the week with the advisor Mr. Gibert to prepare for their trials. Members bear the roles of attorneys or witnesses and work on the case given to them by the Constitutional Rights Foundation. After reading through the entire case, witness testimonies and objections, attorneys must write direct and cross examinations while witnesses practice their acting and memorization skills for the stand. Mock Trial requires a unique set of skills from each member. It teaches students about manipulating language to emphasize a point; their rhetoric and the way they comport themselves is vital to persuading the judge. Students who assume attorney roles must be well versed in law, as well as good public speakers, while witnesses must be able to act and immerse themselves in their roles. 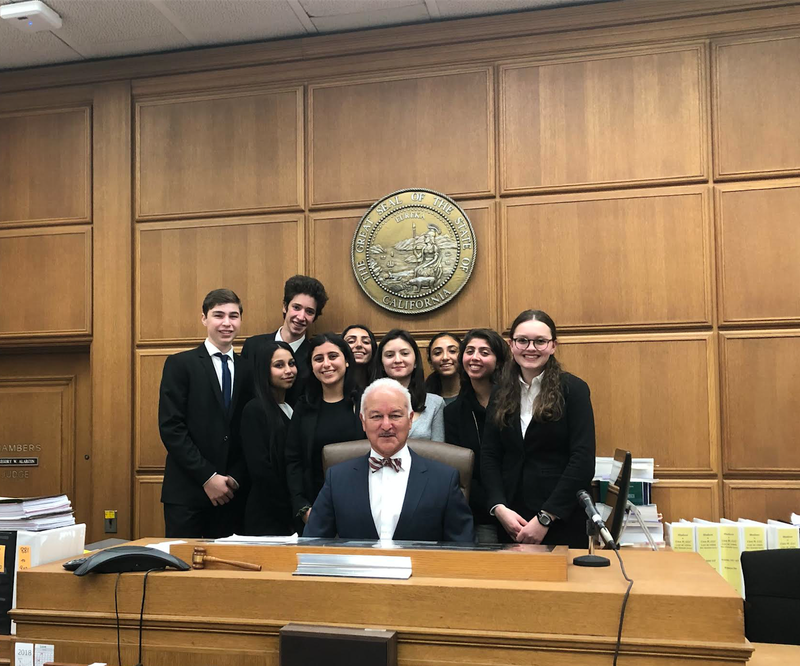 After the flurry of preparation, the team competes in a competition at the Stanley Mosk Courthouse.“It’s amazing to see the immense amount of dedication from students all around the state, competing in real court rooms with real judges. Viewers of the trials always comment that they couldn’t believe they weren’t watching the real deal,” says team member Dani Siman ‘20.